Wrong Place, Wrong Time: Aaron Rivera was pushed through a glass office door and beaten by a San Jose police officer when he went downtown for a Cinco de Mayo event. The officer said Rivera brandished a 9-inch lead pipe, although the weapon later could not be found. SITTING AT THE KITCHEN TABLE inside the office of his father's muffler and radiator shop in San Leandro, 19-year-old Aaron Rivera traces the pattern of two scars on his shaved, stubble-covered head. One, about 3 inches long, crosses near the top on the left side of his head. Another, closer to 5 inches long, descends along the side of his skull, twisting like a flattened question mark, terminating next to his ear. "I try to put it away from my mind," Rivera says in his low, deep voice. But still, he says, he dreams about the night that he got those scars, and wakes up yelling in his sleep. As much as he tries, he can't stop remembering that night: the San Jose police officer pushing him through the glass door of a downtown office building, the officer clubbing him, breaking his arm, bruising his back and hitting his head so hard that his brain swelled, requiring lifesaving surgery. On the night Rivera was injured, San Jose police were searching a crowd of concert-goers downtown for a man who stole a jacket. Two officers mistakenly thought Rivera was the thief, took him into custody and accused him of assault with a semiautomatic weapon, brandishing a weapon, possession of an unlawful weapon, battery and resisting arrest. No weapon was ever found on Rivera or in the area where he was arrested, and subsequently all the charges against Rivera have been dropped, except the allegation that, during the beating in the entryway of an empty San Jose office building, he resisted arrest. The incident left Aaron Rivera hospitalized for four days and his family confused and distraught. His father, San Leandro business owner Ron Rivera, who has reviewed the police report and talked with his son, wants the officer who beat his son to be fired and prosecuted to the fullest extent of the law. Rivera says he plans to sue the city to compensate his son for the beating and for the long-term medical problems he may face. San Jose Police Chief Bill Lansdowne says the incident is under investigation by the department's Professional Conduct and Standards Unit and by the department's internal auditor, Teresa Guerrero-Daley. Chief Lansdowne won't comment specifically on the Rivera beating, but defends the conduct of his officers overall. "Officers have every right to protect themselves," he says. "They are highly skilled to use the appropriate amount of force in situations that require it." Rivera's family plans to launch a civil suit questioning how a 150-pound unarmed bystander, waiting in a downtown doorway, required this much force from the SJPD. AARON RIVERA'S ILL-FATED evening began when he drove his cherished 1968 Oldsmobile Cutlass to San Jose with a friend to see a Cinco de Mayo concert at the Arena. The event was sold out and they never got in. Instead, Rivera says, the two decided to hang out downtown for a while. He parked his car around 11pm, and he and the friend wandered through the crowd letting out of the show. Near Market and Santa Clara streets, Rivera says, he saw a group of people yelling at a police officer who was making an arrest. A person ran past him, saying that the cops just beat up someone, and Rivera heard the rhythmic whump of a police helicopter overhead, while a spotlight shone through the crowd. When Rivera turned around, his friend was gone. Rivera says he wanted to move away from the commotion, so he headed east on Santa Clara Street. He ducked into a doorway, hoping to stay out of the way. Then Rivera says he was hit. "I felt like I was in a dream, I felt so much pain. I woke up on the floor; there was so much blood all over the carpet," he recalls. "It was sticky, like mud. Every time I moved, I got hit, I covered up in a ball," says the 5-foot, 4-inch 150-pound Rivera. But 31-year-old officer Robert Reich-ert, the eight-year veteran of San Jose's police force who beat Rivera with a baton, tells a different story in his report, one that is troubling to both Aaron Rivera and his father, Ron. According to police reports filed early in the morning of May 8, Reichert responded to a call about a stolen jacket near the intersection of Santa Clara and Second streets. According to his police report, Reichert arrived at a scene where there were "200 +/- gang members yelling and screaming." Reichert's partner, officer Albert Valcarcel, pointed out a suspect to him and the man ran. When Reichert told the man to stop, he says, the man kept running. Reichert chased the suspect through the crowd down the sidewalk and says he noticed "a lead pipe, 8 to 10" long," in the person's hand. After running more than the length of a football field, the man turned into a doorway where two girls were standing, and faced Reich-ert, armed with the lead pipe, his hands raised to fight. Reichert says, "Fearing for my safety," he pushed Rivera through a glass door. "Rivera laid on his back flailing and kicking his legs," Reichert continues in his report. "As he did so, I began to strike at him with my baton. As I struck at Rivera he rolled over onto his stomach. As a result I inadvertently struck him across the back (right side). I ordered Rivera to stay down. He continued to flail himself on the ground in attempts to get up. As he began to push himself up off the ground, I attempted to strike him about the right arm. As I did so, Rivera continued to move on the ground. As I struck for the arm, I accidentally hit Rivera atop the head." When Reichert's partner, Valcarcel, entered the building, the report indicates the beating stopped. 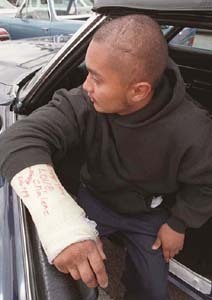 Rivera was taken to San Jose Medical Center, where his skull was opened to relieve the building pressure of the hematoma caused by Reichert's baton blow. His arm was set and sealed in a plaster cast, and he was handcuffed to his bed. The "lead pipe" weapon mentioned in Reichert's report was not collected by police as evidence and has never been found. Rivera's attorney, Denise Zingale, worked as a Santa Clara County sheriff's deputy for 15 years. She doesn't buy Reichert's story. "Even if he had been the suspect, he [Rivera] did not deserve the beating he got. It was very severe, definitely police brutality," she says. "This kind of thing is very upsetting." AARON WAS ADMITTED to San Jose Medical Center after midnight on Friday, May 7. Aaron's family and attorneys were told they could not see their ailing teenager, who had required emergency brain surgery, for 12 days. Department of Corrections spokes-man Mike Hackett says it was a mistake that Aaron Rivera's family was denied access to him. Until six months ago, Hackett says, family members were barred from visiting prisoners in the hospital for 21 days. But on the night Rivera was brought in, that policy had already been rescinded. Hackett says family members are allowed to visit "around the clock" when a prisoner is in critical condition. Ron Rivera was outraged and believes there were other reasons at work. "They didn't want us to see Aaron in that condition, with his face swollen--the black eyes, his head bandaged," he says simply. "They did not want to make things worse." The day after the beating, Ron Rivera made a sign which read: "San Jose Police, please don't make me wait 12 days to see my son," and protested at the site where his son was beaten, outside the hospital, at the county jail and at San Jose City Hall. A few passing police officers gave him a thumbs up; Rivera says he believes that there are many good cops on the force who want to see police conduct improved. Many glared at him, and one even gave him a jaywalking ticket. But finally his strategy worked. Lieutenant Glenn McCourtie, who saw Rivera protesting downtown, decided to look into why Rivera's family and attorneys were being prevented from seeing their son. McCourtie told Ron Rivera there had been a misunderstanding. On Mother's Day afternoon, Sunday, May 9, Rivera's family was finally let into the hospital room. What they saw was their 19-year-old son cuffed to a hospital bed, his face swollen, his eyes blackened, his right arm in a cast, and his head bandaged. Out of the bandage, a tube, running red with blood, led to a half-full container at Aaron's side. During the day and a half that Ron Rivera walked the streets of San Jose with a placard, hoping to see his son, he got in touch with the Citizens Tribunal, a group formed by members of the disbanded civil grand jury who are gathering information about corruption in the police force. Darryl Williams, who leads the Citizens Tribunal, chuckles cynically about officer Reichert's police report description that the downtown crowd was made up of "200+ gang members." "They have assumed that blacks and Hispanics and Asians are gang members. They have to get away from identifying us with a tag that lets them feel justified with using deadly force," Williams says. IN THE AFTERMATH of the Rodney King beating in Los Angeles, cities began to look for ways to increase public oversight of police. But rather than appoint a review board that would do its work in public like those in Oakland and San Francisco, the San Jose City Council decided in November 1992 to hire an independent auditor. The auditor, Teresa Guerrero-Daley, does not investigate complaints herself, but merely looks over the shoulder of internal investigators. Because internal investigations are classified as "personnel matters," all findings can be withheld from the public and the press. In the last year, 300 to 400 complaints of police misconduct were registered with the San Jose Police Department and with Guerrero-Daley's office. But only a fraction of those complaints were fully investigated. Most of them were not followed through on because the forms were left unsigned by victims or the complaints were resolved internally or were withdrawn, Guerrero- Daley says. Findings were reached on 121 complaints, and 30 of these were upheld, resulting in everything from additional training for officers to termination. Guerrero-Daley says one officer was terminated in the last year as a result of a citizen complaint. She also states that this internal process works best. It allows her to develop a relationship with the chief and investigators, pushing them to be rigorous in their investigation. Additionally, because the investigation is confidential, officers are compelled to talk to investigators and can be terminated if they lie or don't cooperate. In public proceedings, officers can plead the Fifth Amendment, refusing to incriminate themselves, especially in cases where criminal charges can be brought. And within San Jose's system, she says, she can push for department-wide change that moves beyond a case-by-case approach. John Crew, a police practices attorney for the ACLU, disagrees. "It's still police policing themselves," Crew says. "The biases are not removed." Darryl Williams also sees holes in San Jose's model. "We get 10 complaints a week from guys who have been through the independent auditor's office and who end up with zero exoneration." In addition to internal reprimands and firings, Williams wants to see more officers prosecuted for their illegal activities, and hopes that the good officers on the force will start to step forward and identify their corrupt colleagues. "Until the good officers stand up, it's hard to tell the difference between the good and bad ones. It is unfair to those who go into law enforcement for the right reasons." Because police officers are expected to use force in certain instances, it is very rare that they are prosecuted for stepping over the line. Since 1990, the Santa Clara County district attorney's office has brought only three cases against police officers for violent misconduct, and all were misdemeanors. In the three cases, one officer was convicted, one case was dismissed and one officer was acquitted. Most cases of alleged brutality are handled in civil court, where 40 to 70 complaints are filed every year. Between 1994 and 1998, the city paid $872,536 in settlements in 41 different civil cases that alleged misuse of force, says city attorney Joan Gallo. "We very seldom pay out on police misconduct cases," she says. "We have an outstanding police department and an outstanding group of litigators. That is the magic combination." AT HIS FATHER'S small muffler and radiator shop just off Highway 580 in San Leandro, Rivera sits in a chair, head down, surrounded by long metal pipes and ailing radiators. He used to help, but now, with his right arm in a cast, he watches his father, busily looking over the underside of a car up on a lift. For the last year and a half, Rivera had been living at home with his family and learning the business, hoping one day to take it over from his dad. Now he just answers the phone and watches. Taking a break from his work, Ron Rivera says he hopes that Reichert will be prosecuted and banned from police work. And at the very least he hopes the city will be forced to pay his son for the pain he has endured. "I'm not against all police officers," Rivera says. "Just the ones who do business like this." From the June 17-23, 1999 issue of Metro, Silicon Valley's Weekly Newspaper.